Plot: The New Avengers race to New Orleans to try to get to Daimon Hellstrom, Son of Satan before the demon possessed, Dormamu minion The Hood gets there first. Why? Because they think Hellstrom might be the new Sorcerer Supreme, which sound likes a Dairy Queen Harry Potter tie in but isn’t. Unfortunately, Madame Masque is waiting for them with a bazooka. Review: Bendis gets a lot of grief over being the ruination of Marvel writing and a lot of folks want to know where he got his rep in the first place. Not for nothing. Dude bought his own press and spread himself way too thin quite some time ago now and people forget what an awesome book Alias was. It’s no secret I think the current Avengers franchise gives train wrecks a bad name. That being said, New Avengers is the Avengers book that makes me scream the least. I’d put money it’s the book Bendis actually spends some time writing instead of whatever bad mojo he gets up to that account for everything else he’s got a finger in the plotting and/or writing of. This issue is a great example in that it’s got some great Bendis stuff and some Godawful Bendis stuff. In the Godawful column there’s the Bendis passion for racing off on a friggin’ complicated new plot line before dealing with any of the ramifications of his last plot line. He’d barely introduced the new Avengers when we had the whole civil war cluster ph*ck. That bled right into the Skrull invasion without any sort of rap up and now we don’t deal with the aftermath of that because the New Avengers have to deal with this whole new Sorcerer Supreme story line. I guess Bendis must think if he brings in a new plot line he never has to finish an old one and we’ll all be so confused we’ll never figure out there must be like a dozen Wolverines to account for him being everywhere at once. Hey, Bendis! You can have that idea for free! You don’t have to figure out the Sorcerer Supreme dealio ‘cause now the Avengers have discovered theirs a whole brotherhood of identical Wolverines! And one of them has gone bad! And one got exposed to gamma rays! And one is a Skrull and they’re all identical cousins and a hot dog makes them loose control. If you get that reference you’re as old as me. But there’s some very funny dialogue that sounds almost vintage Kevin Smith. The pacing is excellent, shifting back and forth between the demon battle in the streets of New Orleans and Masque blowing the Avengers out of the sky and then making a run for it. Billy Tan deserves serious praise for his panel storytelling. There’s a five page battle sequence that culminates with Spiderwoman and Masque fighting in a smoke bomb fog that’s very cool and almost makes me think of when I read the Avengers for pleasure. No skip the sarcasm, it’s downright good. And the ending... I won’t spoil it. Lets just say the eye ends up somewhere that’s such a bad joke it might be brilliant. Of course it might just be stupid. We’ll have to see what kind of attention Bendis pays to what he’s doing before the next whirl wind plot device comes in like a tsunami to wash away anything difficult he might have to tackle. I stopped reading Marvel a while ago, and Bendis is a big factor in that. I really think in about two or three years he'll take an extended "hiatus" and never return. I can't read anything Bendis writes with more than three characters in it, because they all "sound" exactly the same. Everybody, from Hawkeye to Dr. Doom to the Skrull Queen, has the same snarky/pissy personality, except for Spider-Man, whom is written basically as Woody Allen. 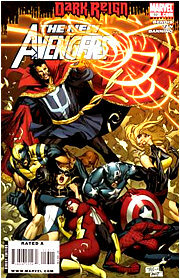 "I like that first cover because it looks as if Doc Strange is putting the New Avengers out of our misery." Oh god, the ending - I'm going with flat-out "stupid" myself - with a good bit of "racist" and "WTF!?" thrown in as well. Max, just stop reading Marvel. Grant Morrison has just started a Batman & Robin series that he calls "The Adam West show combined with David Lynch", and it looks promising as hell. Here's the min reason I still read books like this (Not all marvel books are bad, just way most); It is more fun to review bad stuff. I also review dollar box stuff and indie stuff from time to time. I have an old habit of buying the two books I've followed my whole life (which is most of their lives) X-men and Avengers. Once upon a time that was two good books a month. Now it's twenty some odd mediocre and bad books. It's like an old relationship gone bad.